When you are choosing bass fishing rods, you have to consider a few things. Weather, time of year and water depth are a few things that will usually determine what lures you will use. After you decide on the lure for the situation, then you will need the correct rod for that lure or lures. Well, let’s see if we can figure out what kind of rod you need to purchase. Abu Garcia and Berkley are well known companies that manufacture nice rods, but there are many other companies that manufacture top quality bass fishing rods. 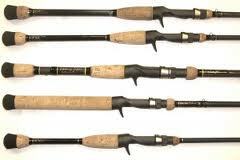 Bass fishing rods are made of graphite or fiberglass or a composite of both. Graphite is light and very sensitive. Rods made of graphite are also flexible and strong. The more expensive graphite rods are very strong and very flexible. They are also brittle and may break if handled carelessly. I mean if you stumble and step on the rod then it will break. If your kids are having a sword fight in the back yard with your high priced graphite rods, then yes it will break. If your wife whops you over the head with it, then yes it will break...hmmmm! Fiberglass rods are heavier and less brittle compared to graphite rods. Many anglers say that fiberglass rods do not have enough sensitivity. All bass fishermen want their rods to be sensitive don’t we? Yes we do! Most rods are now made of a composite of graphite and fiberglass. This combination produces a rod that is durable, sensitive and not high priced. Sounds like a winner to me. Baitcasting and Spinning are the two types of bass fishing rods. Baitcasing rods are made to position the reel on top of the rod. The line guides are also on top. Trigger grips are used to give leverage and allow the thumb to feel the line as it is going out. The handle may be long or short. 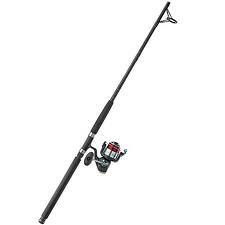 Baitcasting rods are used more for heavy action fishing. This type rod is popular in the South. Yes I do have one. Spinning rods are made to hang the reel below the rod. This type does not have a trigger grip. It has long straight handles to provide balance in your hand. Spinning rods are made more for light action. When fishing a small or light weight lure, you should use a light to medium action rod and an 8-12 pound line. A spinning rod might be good here. When fishing a heavier lure, you should use a medium to heavy action rod and a 12-30 pound line. A baitcasting rod could be used effectively here. Each type of bass rod has unique characteristics that are matched to use on a specific fishing technique. However you will find that most techniques can be fished with both types of rods. It is only a matter of experimenting and finding out what works best for you.